Known worldwide for the important role it plays in London’s Central Business District, Canary Wharf is one of the UK’s financial hubs. Although it has a reputation for being home to stockbrokers, insurance firms, and other financial magnates, you will also find an array of retail giants and leisure firms there. From accountants and stockbrokers through to architects and designers, Canary Wharf certainly isn’t short on professional talent. It forms a significant part of London’s service industry, with investment firms appearing to reign supreme amongst all the others. With between 25,000 to 75,000 financial jobs per square mile in the area, it’s clear that Canary Wharf’s monetary reputation is accurate and well deserved. In addition to investment firms, a significant proportion of the world’s industrial insurance is brokered in Canary Wharf. Alongside the City of London, this area accounts for 183,000 members of staff in the financial sector. As London is seen as a key investment centre worldwide, it attracts some of the globe’s greatest banking talents. With plans for 3,000 new homes in Canary Wharf and Tower Hamlets, it seems as though business is expected to grow. As anybody with a keen interest in the area may already know, Canary Wharf was born after the closing of the India trading docks in the 1980s. While it has seen significant progress in terms of jobs and investment opportunities, the government is always looking for ways to enhance this. Another plan in the works is a high-speed rail link called the Crossrail, which is due for completion in 2018. This, plus an increasing number of jobs in the area, means that property development is also set to flourish. If you’re looking for the headquarters of a banking or financial giant, the chances are you’ll find it in either Canary Wharf or the City of London. Both British and international banks are accounted for. On the British side of things, there’s Barclays and HSBC. In terms of international banks, there’s Credit Suisse and J.P. Morgan. The development firm responsible for over 900,000 square metres of the area is known as the Canary Wharf Group. With over 950 employees, it’s a significant employer in the area itself, and is responsible for making sure development continues there. Part of the way it does this is to ensure the area is attractive and fun for employees. While many of the main financial groups have moved from the City of London to the East End, not all employees are happy about it. One of the main reasons for this is that Canary Wharf lacks the thriving lifestyle that the city offers. However, with more bars and shops opening there and rents continuing to be cheaper than the City of London, banks continue to favour the area. 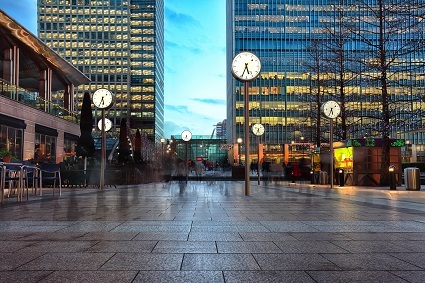 Although Canary Wharf attracts some of the wealthiest people in the country, you may be surprised to learn that you can rent an office there for as little as £15 per square foot. Average prices, however, are more within the £45-55 per square foot region. Employers can typically expect to pay around £600 per desk. One of the main reasons for the low-cost rental prices in the area is the ongoing development from the Canary Wharf group, as well as the government. With investors building upwards as well as eastwards, there’s no chance of office space becoming scarce any time soon. If you’re running a young business but you’d still like it to be close to corporate giants, you’ll certainly benefit from the low-cost office prices in Canary Wharf. While some may worry about being a little to far away from London City Centre, it’s worth considering the excellent transport links there. Using the Docklands Light Railway, employees and clients are easily connected to London City Airport. Several bus routes take employees throughout the Docklands, as well as the rest of London. In addition to the Docklands Light Railway, there’s also Canary Wharf tube station, and National Rail overground services are due to be completed in 2017. If you’re looking for alternative forms of transport, there’s always one of the national cycling routes, or you can use a riverboat. While Canary Wharf isn’t as close to the rest of London as other areas, it’s affordable office rates and excellent transport links make it ideal for many small, medium, and large businesses. For further information on office space available in Canary Wharf click here.